The german weekly newspaper DIE ZEIT publishes a themed germany map in its magazine supplement each week. For a new map we did a research about cities on german stamps (since 1949) during the last 12 months. As an extension to the map we will publish the complete list of cities here. We start with the Top 20 and a little evaluation of the results. As was to be expected most german stamps are referring to Berlin, the capital, which had its own branch of the federal german post Berlin during the times of West-Berlin (1949-1990). 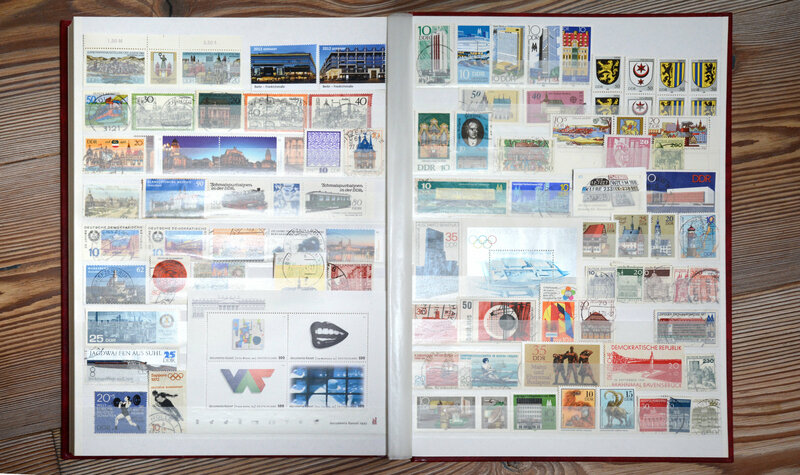 However, even without this whole set Berlin is still the top city on stamps of the GDR as well as for FRG/Germany. Runner Up is Leipzig, the second largest city in Eastern Germany. 95% of the stamps referring to Leipzig were issued in the GDR (DDR) before 1990 and half of those were referring to the Leipzig Trade Fair (Leipziger Messe), which was a stamp theme twice a year during the spring and autumn fairs. Dresden in 3rd place was predominantly mentioned in regards to its museums and art collections as well as its baroque buildings (mostly during GDR times as well). The Staatl. Mathemat.-Physikal. Salon Dresden (Royal Cabinet of Mathematical and Physical Instruments) was a subject for three stamp series on its own. Munich is leading the list of cities on FRG (BRD) stamps before 1990 (followed by Hamburg and Berlin). A major subject during the 1970s was the Olympic Games of 1972 in Munich – to this day still the only Olympic Games in Germany after WWII. On 5th place we find Erfurt. The capital of the state Thuringia was the regular location of the largest gardening and park exhibition of the eastern block – the IGA, which was another regular subject on GDR stamps. Following up on 6 and 7 are Hamburg and Frankfurt (Main), both cities with a wide variety in subjects on stamps. On position 8 we find Saarbrücken, the capital of the Saarland which plays a special part in this list. Between 1947 and 1959 the Saarland issued its own stamps in french Franc. So besides the stamps of the Deutsche Post der DDR (1949-1990), the Bundespost Berlin (1949-1990) and the Bundespost BRD/Deutschland (1949-today) the Saarland is the fourth collection field of official german stamps that we included in this investigation. We started in 1949 and ended in 2017. That is because before the GDR and the FRG were founded in 1949 the publishing of local stamps in Germany was a very fragmented affair. Amongst the next cities there are some more subjects that stand out. Meissen has been mentioned mainly in series about the famous Meissner Porcelain (the first in europe), Jena has been mentioned in connection with the optics company Carl Zeiss, Hanover has often been mentioned when the EXPO 2000 was held and Bremen can thank the popular fairy tale of the Bremer Stadtmusikanten. All these cities with 5 or more mentions have made it onto the germany map of the ZEIT magazine. Often it was popular buildings that resulted in mentions for cities like the Wartburg in Eisenach, the Bauhaus in Dessau, the roman Porta Nigra in Trier, the monastry in Lorsch, Castle Moritzburg or Castle Neuschwanstein, which is located in the bavarian town of Schwangau. Another repeated subject, especially on GDR stamps, was the remembering of the concentration camps. In Oranienburg near Berlin (position 32) there had been even two of those, the KZ Oranienburg and the KZ Sachsenhausen. Also frequently found on german stamps are half-timbered houses and lighthouses. While the first are always found inside a city or town, the latter are not always found in a location that is part of a municipality. No official stamps. 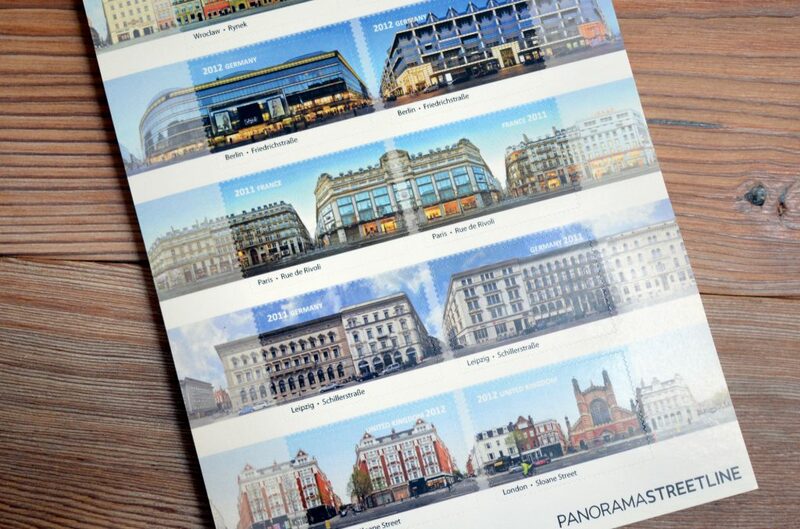 These decorative stamps produced by ourselves in 2012 present Leipzig and Berlin next to London, Paris and Wroclaw.